Home gardeners like a challenge and will often go to great lengths to succeed with a particular vegetable or fruit. And they have great stories to tell about their on-going quests. Lopez gardener Carol Noyes is a perfect example. Beans are her story. So began Carol’s search for dried beans that would ripen on Lopez. Her project, now moving into its second year, is satisfying her desire to find beans that grow well here but just as important it’s satisfying her passions for experimenting and learning and for collecting beans that are not only delicious to eat but beautiful to look at. 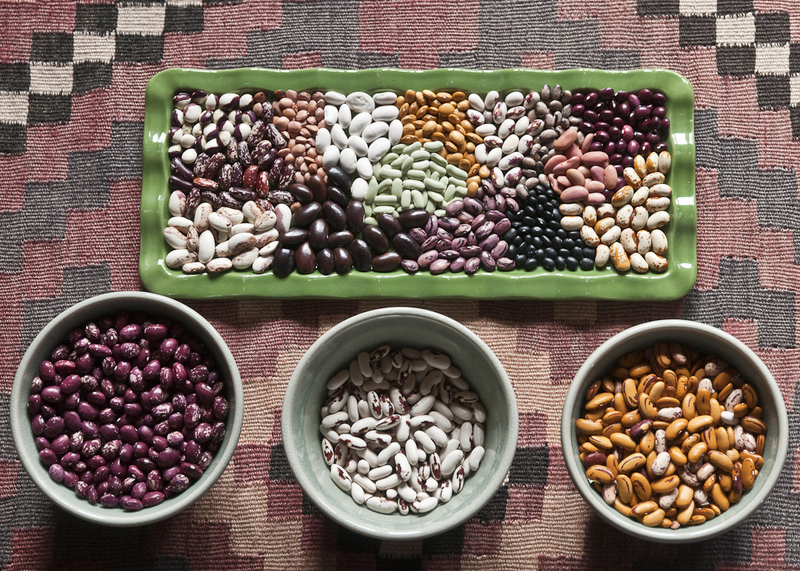 Last year, Carol planted 127 varieties of beans, mostly from New England, New Mexico or Europe. Imagine the logistics! She started them in early May in four-inch pots in three batches, beginning with the pole and other long season beans. The seeds germinated quickly on a propagation mat and she transplanted them into a new garden spot where she was hoping to improve the soil with this huge crop of beans. “Originally I thought I was going to have a lot of beans,” she said, “but by September I realized it had been a cold season and it was starting to rain and I was not going to get that many beans. I was a little disappointed for about five minutes, and then I realized this was a good test year. I’d really get a better idea of what would survive.” Ultimately she ended up with a little over a hundred varieties of dried beans. This year, she’s planting bean varieties from Europe, Southern Appalachia and Canada. Her planting strategies will be the same but this year’s bean candidates offer new possibilities and tastes. Carol is happy to share her findings as well as her many sources for bean varieties. Look for the folder titled Dried Beans for Lopez in the Reference Section of the Lopez Library.